Mission Statement: To save working breed dogs from death row pounds, shelters, private surrenders and farming properties, from being killed. To care for them, arrange veterinary treatment, provide training and rehabilitate the dogs, before finding a suitable and permanent home for them. All dogs are vaccinated, microchipped, worm and flea treated and desexed before being adopted out. We have had a horror week with sick and injured puppies. 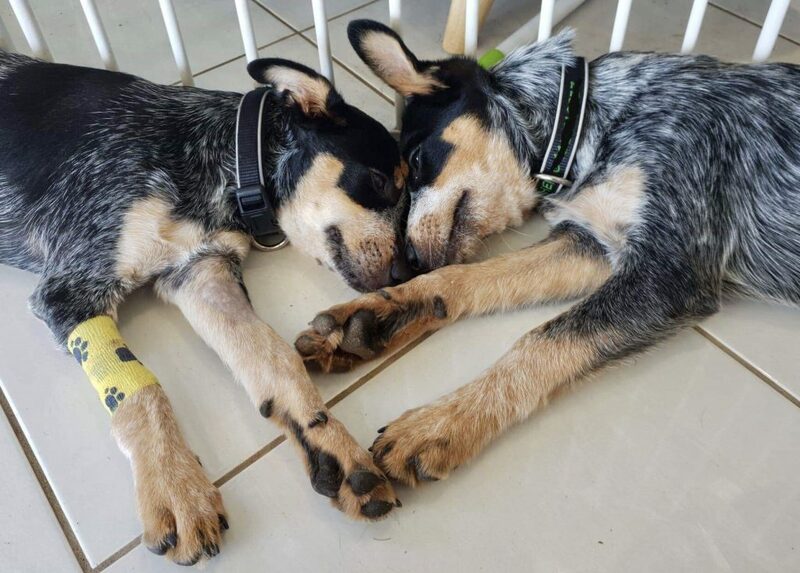 Our 6 little blue cattle dog puppies we saved from a remote NSW Pound got saved and on transport. On Friday Penny crashed with a severe temperature, not eating or drinking, very flat and diarrhoea. She had to spend 3 days at the vets and was then able to come home to be monitored and checked by the vet daily. Since then, her sister Ellie has also crashed with the same symptoms. She was admitted to the vets yesterday with a temp of 41 and is still there fighting. So far all tests have come back negative, so samples have now been sent off to the lab. They are getting the best care and treatment possible, but the bills are sky rocketing and we need your help please. Next we saved Gracie, who was presented to a vet to be euthanised because of an untreated cut on her leg which had become severely infected. Thankfully the vets contacted us and we agreed to take Gracie on and get her surgery done to repair the infected injury. Lastly, yesterday afternoon, little Ivanna was happily playing outside when she suddenly became quiet, and soon after collapsed, motionlessly laying on her side. Her carer rushed her to the vet and she thankfully started to perk up later in the day, with venom tests coming back negative it was put down to an anaphylactic reaction to some kind of bee or wasp bite. She is doing much better and home now with her carer. These bills have already exceeded $5,000 and still climbing. We are really struggling right now and really need your help to continue treating and saving all of these precious souls who deserve their second chance. Please keep Penny and Ellie in your thoughts and we will keep you updated. Amazing work that you do, please give Penny and Ellie extra cuddles ! my donation is small, but wishes and prays are huge . Hope those pups get better soon. In loving memory of our boy Rocky. His way of helping these pups live their best lives.